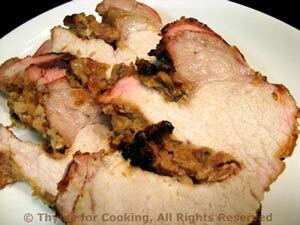 Thyme for Cooking Weekend Menu: Grilled, Stuffed Pork Loin, easy recipes. Typical fall cooking, using both the oven and the barbecue grill. 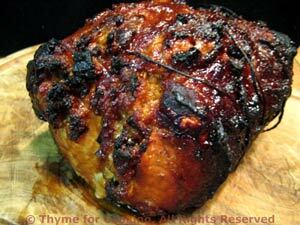 Both pork and potatoes are for 2 meals. Simple ingredients but complex tastes. We tend to think of pesto as something for cold or barely warm dishes but it mellows and permeates the potatoes in this, slightly cheesy, gratin. I used a cheese called Mimolette, but Colby or mild Cheddar would be good. This makes enough for 2 meals. Thinly slice potatoes and cheese. 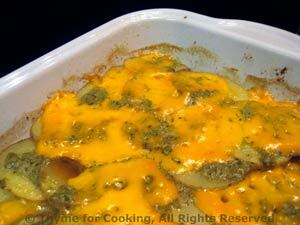 Spread half of the pesto over the potatoes and top with half of the cheese. Cove with foil or a lid and bake, 400F (200C), for 45 minutes. Uncover and bake 15 minutes longer. Remove and serve. 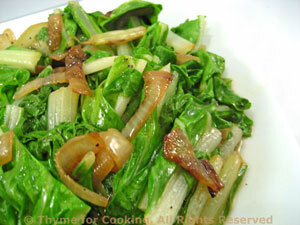 A simple dish of sweet onions and slightly bitter chard. Wash the chard and trim any bad bits. Stack the leaves together and fold over, the long way. Slice into thin strips, using both leaves and stems, but keeping the stems separate. Heat oil and butter in a large skillet. Add onion and sauté over medium heat until onion is nicely browned. Add the chard stems and sauté 5 minutes longer. Add the chard leaves and stir until the leaves soften and fit into the skillet. Reduce heat, cover and let cook until chard has wilted.